An absolute highlight of Long Division 2018 was Billy Bragg’s performance at Wakefield Cathedral. 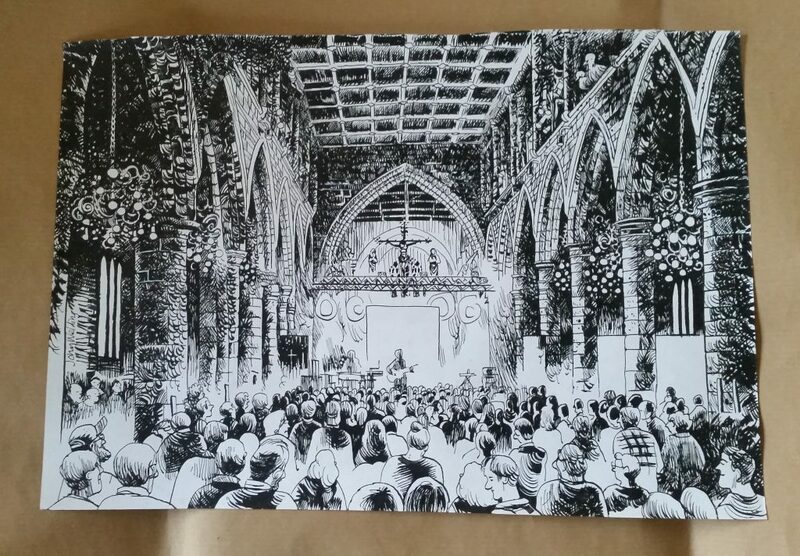 The moment was captured by illustrator John Welding, who we had commissioned to illustrate various performers and stages across the weekend. The original A3 copy of John’s illustration is being put up for blind auction, in order to raise funds for our #YoungTeam project. #YoungTeam is a pilot of a Silver Lever Arts Award (GCSE equivalent) in DIY Events Programming – the first of it’s kind. You can make a bid via this Google doc, or in person at Wakefield Artwalk on March 27th, Create Cafe from 5pm til 7:30pm. That event will also see us exhibit more of John’s illustrations, prints of which will be available to buy, also to raise funds for #YoungTeam. The deadline is midnight on March 28th. Bids include the cost of postage if required. Good luck – and thanks for supporting our work! Previous Post Peter Hook & The Light, We Are Scientists, Asian Dub Foundation, Penguin Cafe & More added to 2019 lineup..